Smoking! Chess, playing the piano, movies (mostly old ones), motorcycles, Tennis. Might take up Golf soon! I store mine without the tubes. When the cigars arrive, I always examine each one to find out what I've got. It doesn't seem worth the effort to put them all back into the tubes and have to take them out again later to smoke. Now, when I want one, I can just grab it out of the humidor. Some marques sell the same cigar with and without a tube, and I suppose there should be some difference in the taste of the 'tubos' version, because it has been stored differently (usually wrapped in cedar). So by taking the cigars out and storing them without the tubes, I suppose you could be altering the taste, and losing the uniqueness of the vitola. On the other hand, I like the idea of each cigar having a little space to breathe. I have always felt that plume/bloom/mould on cigars is generally mould, and not desirable in any way. But I think there is more hope with pipe tobacco.... This! I'll be fascinated to see the results of this. Personally I think there is a good chance of finding sugar crystals. Pipe tobacco often has sugar added during processing - even in brands that are marketed as being 'uncased' and 'untopped'. For example, Escudo/Dunhill Navy Rolls has several added sugars, including prune juice and licorice extract, along with dextrin, glucose and fructose. I agree that the plume/bloom/mould that appears on pipe tobacco is more often something that appears to reflect light as a crystal. Isn't there a 'thing' about mould not being fluorescent under UV light? Wouldn't that be a quicker way to check if something is mould or not? EDIT: Didn't mean for this to sound like we didn't need this experiment carried out - it's excellent that we're finally getting some concrete scientific data. I just wondered if people at home could quickly check for mould using the UV method (if it actually works). I'd love to see another test....blind testing of cigars that have, or have had, mould on them. I've heard people say that one should just brush off the mould, and they will not notice any difference. If you believe this, then you probably will not notice any difference. If you believe/believed that the mould was beneficial, you will probably have an improved smoking experience. However, if you're like me, and believe that a mouldy cigar is not a good thing, then you'll probably taste mouldiness while you're smoking. The point is, each of these could be our imagination, and it would be nice to see some solid tests around this! Can you change the 24:24 time table in you info page? The east coast and west coast times are off by an hour. Maybe due to day light savings. It should read east coast, NY, 20:30 and pst 17:30. I only just saw this message.....sorry for the late reply. The times in the post should be correct. The east coast times are EST. I realise that it is not currently EST in the States, although I seem to see it still being called as such during US TV broadcasts for example! Anyway, I did go on to provide an explanation about the times - basically that one needs to adjust for when the US is on EDT and not EST. Actually....thinking about it, most US TV tends to state the time as 'ET' which is not very useful at all! In any case, when I originally wrote that article I thought it better practice to provide an explanation, rather than have to go back and edit the article over and over. Thank for replying. I also thought it may be due to day light savings were we adjust the clock 1 hour + or - the season. Thanks. Where do you wear your wristwatch? Smoker replied to Smoker's topic in Cigars Discussion Forum "the water hole"
I agree that having the face on the inner wrist is unusual. But I'm interested in knowing the origin or reasons for people who wear their watch on the outer wrist. Some have said that it's easier to scratch the dial if you are resting your hands/wrists on a desk or keyboard.....hmmmmm. I personally don't find this to be the case, but I can see what they mean. Still, I believe it is more natural to look at something on the inside of your wrist. Imagine you had a pocket watch...you would look at it with your wrist turned in. In fact, when we put anything in our hand to look at, we have our wrist turned inwards. I think the main reason for the outer dial being conventional is because that is how watches appear in advertisments (advertisers tell consumers what to do). Over time, people just copy each other, as that is what appears 'normal' or 'correct'. Also, regarding the Rolex forum....I think most poeple who buy a Rolex probably want everyone to see it. So this could be biased data. Are you a dentist? To those guys who wear their watch on the right wrist.....don't you have difficulty if you need to wind the watch, or adjust the date etc? I guess you take it off for these tasks? Smoker replied to El Presidente's topic in Cigars Discussion Forum "the water hole"
Glad you had a lucky escape! I was involved in a similar situation a few months back. As inconvenient as it is to go through all the motions with the insurance and police, it's obviously better than what could have happened! It has taken months to have the 3rd party insurer admit liability (luckily he had insurance). Now, just waiting to see if the police are going to prosecute him for failing to stop at the scene of an accident. Someone called Mr Glass flying on a trapeze. This has disaster written all over it! Hahaha, this is what happens when you combine single-barrel bourbon with late-night browsing. Ok ok, I want to change it to a Bolivar Cañonazo (Siglo VI size). And let's hope nobody noticed that earlier post. Smoker posted a topic in Cigars Discussion Forum "the water hole"
After seeing a watch-based thread, I realised that almost nobody seems to wear their watch with the dial facing inwards. I do this for two reasons. The first is that I find it more natural to look at the inside of my wrist than the outside (less turning of the hand required). Secondly I believe it protects the dial from being knocked or scuffed as easily. Historically, I think the wearing of the dial facing outwards, was pushed by manufacturers so that their watches would be 'advertised' to others. Does anyone know more about these origins? My own watch is only worth around £500, but if I had some of the high-end watches featured in the thread above, I would be even more inclined to be discreet, and keep the identity of the watch concealed. After all, I wear it so that I can see the time, not so that other people can look at it! Ok, so I guess that's 3 reasons to wear the dial on the inner wrist. Where do you wear yours, and what is your reasoning? I usually steer clear of LEs, so I'm not sure what's been done before. 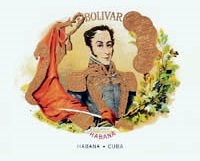 But as I'm getting a box for free....let's have a Bolivar Campanas (52 x 140mm). Yeah yeah...first the members map, and now this! This explains why Monday is clearance day...there's suddenly a load of extra boxes lying around! I have quite a bit of work to do, and some E-mails to send....loose ends etc. I might even chase up my cigar merchant for some PSP boxes....this is what happens when you purchase from a guy with only 2 trader feedbacks on his profile. But my highlight of the weekend is going to be watching Joshua vs Klitschko! Can't wait to find out if Klitschko still has it, or if he's going to be fighting one of his boring 'back foot' fights, and get beaten to the punch by the younger, faster Joshua. I'm also hoping that Rafa makes it to the final of Barcelona, hopefully to give Murray the thrashing of a lifetime.